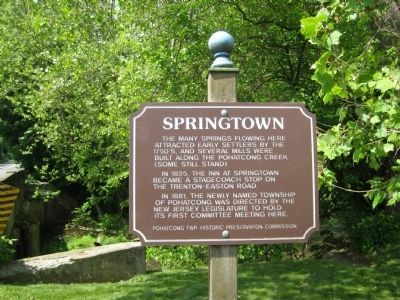 The many springs flowing here attracted early settlers by the 1750's, and several mills were built along the Pohatcong Creek (some still stand). 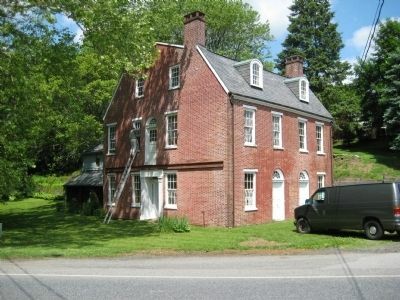 In 1825, the Inn At Springtown became a stagecoach stop on the Trenton-Easton Road. In 1881, the newly named Township of Pohatcong was directed by the New Jersey Legislature to hold its first committee meeting here. Location. 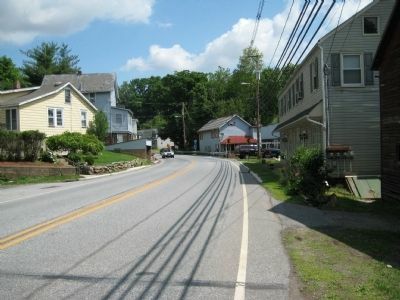 40° 38.856′ N, 75° 8.898′ W. Marker is in Springtown, New Jersey, in Warren County. Marker is on Springtown Road near Browne Lane, on the right when traveling south. Touch for map. Marker is in this post office area: Phillipsburg NJ 08865, United States of America. Touch for directions. (approx. 1.2 miles away); Jersey Central Lines (approx. 1.7 miles away); Hughesville (approx. 1.8 miles away); Greenwich Township Veterans Monument (approx. 2 miles away). Touch for a list and map of all markers in Springtown. More. Search the internet for Springtown. Credits. This page was last revised on June 16, 2016. This page originally submitted on May 30, 2009, by Alan Edelson of Union Twsp., New Jersey. This page has been viewed 807 times since then and 12 times this year. Photos: 1, 2, 3. submitted on May 30, 2009, by Alan Edelson of Union Twsp., New Jersey. • Syd Whittle was the editor who published this page.